With Paper PhotoCube 1.1, making photo cubes is fun and easy. Using the visual, single-screen interface - just drag selected images onto the template and click print! Or, save a JPEG version for emailing or publishing on the Web. In the SE version the top face of the cube is locked to a branding image provided by TriVista Technologies, Inc.. If you'd like to make this software available on your site and your Website meets their requirements TriVista Technologies, Inc. would be willing to replace the locked image with one you provide, allowing you to distribute a fun, useful product to your members or customers for free and promote your brand at the same time. Text and images courtesy of TriVista Technologies, Inc. 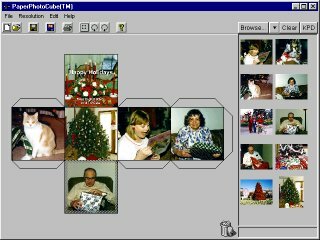 Copyright 2000 TriVista Technologies, Inc.